Fiona looks fabulously put together, in my opinion, but the individual components of her outfit don't all necessarily match each other in a traditional sense. 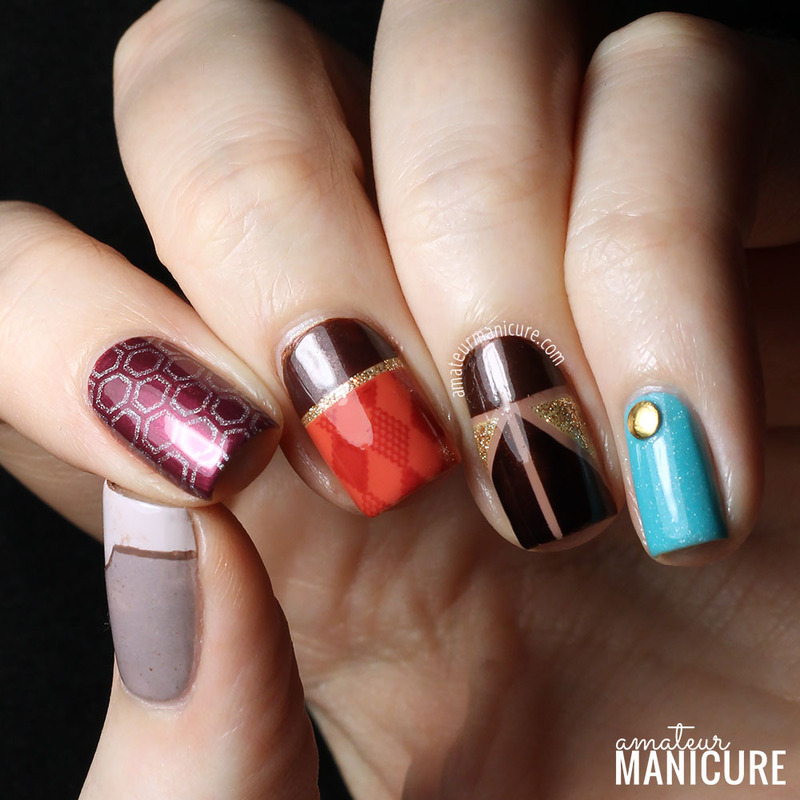 Thus, my strategy here was to match colors and elements across nails, as much as possible, to tie things together. The gold, for example, appears in little bits almost everywhere in her outfit, so that color features on multiple nails; in addition, I moved the gold buttons from her "vest" nail to the teal nail to bring that one into the fold a bit better. 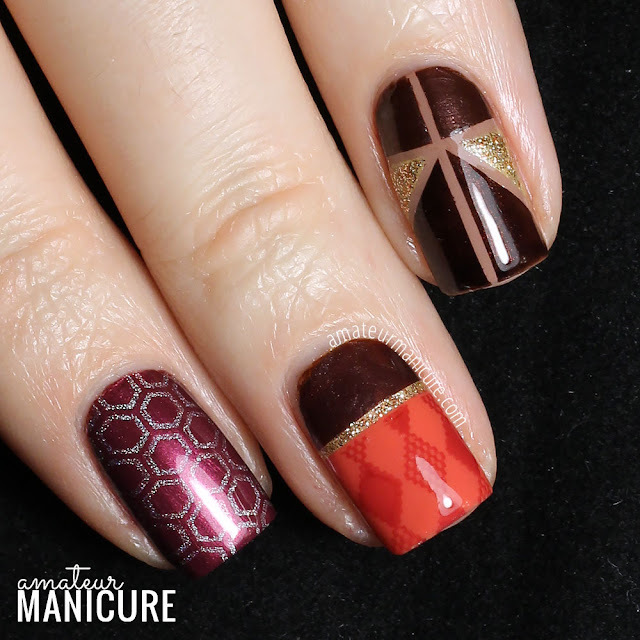 I really struggled with whether to do gold striping on the maroon vest nail as well, but in the end, I'm weak and I loved that hexagon pattern too much to break it up. I also felt like things were hovering at the edge of maybe being too busy? So that was another reason I held off. But looking at these pictures now, I can easily imagine a version with more gold that would also probably work well. 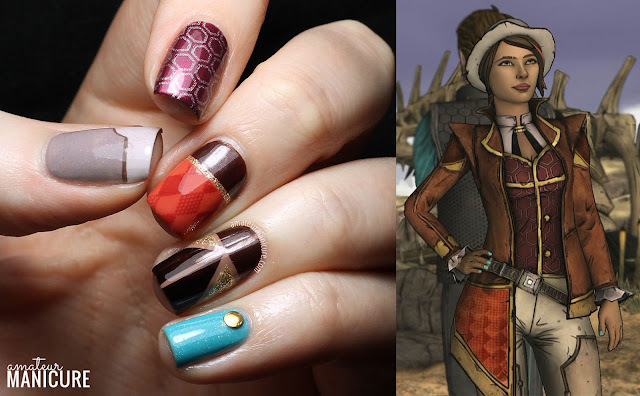 As with my Rhys nails, the thumb design is a bit of an outlier, but I'm okay with that. I like how the pants design translated to the nail (and thumbs are weird anyway). Here's a closer look at the three middle nails—probably the most cohesive of the bunch. 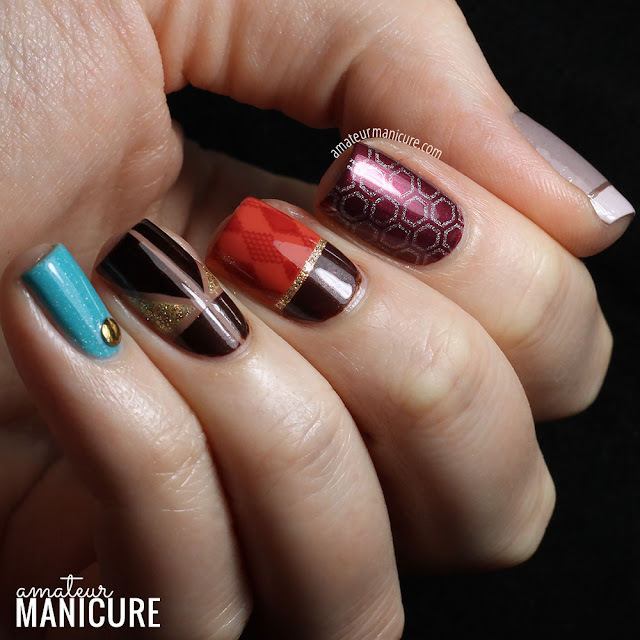 I really love how these turned out and could see pairing these with plain brown thumb and pinky nails for a slightly toned down but still Fiona-eque look. If you haven't spotted it yet, the teal pinky nail is a nod to Fiona's own teal nail polish that she wears throughout the game. I really love that choice by the designers to give her a bold, contrasting nail color that doesn't necessarily match her own outfit, but does complement other color palettes in the TftB world (like maybe Rhys's colors, ahem?). I think that's everything! I would say that this will be my last manicure inspired by this game, but you never know where or when the need to express fannish feelings may strike. (Nerd life! It's so tough.) I do intend to dive into some holiday looks very soon, however—I'm only human and all the the cute sweater print patterns are calling to me—so if that's primarily what you're here for, hang tight. But thank you again, Telltale, for an amazing ride with this game. I can honestly say that it's changed me as a gamer and a person, and I'll always be grateful. Each nail came out fantastic, as a whole matches perfectly the character. 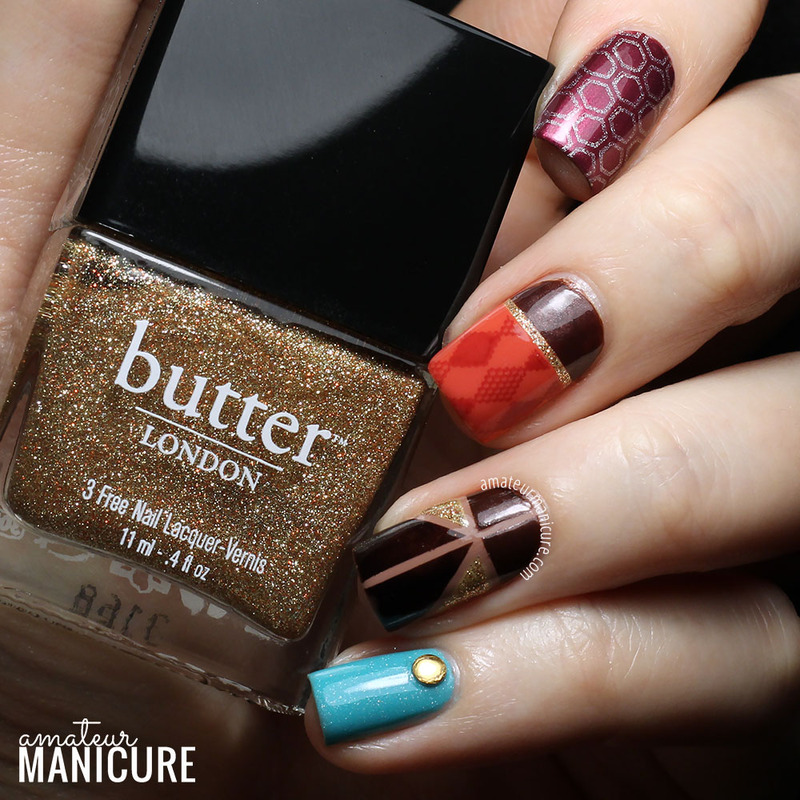 I absolutely love this, each nail is perfect and the whole mani is awesome! Magnificent! I`m attending one of the professional nail art studios . Hope, one day, I`ll become such a great artist as you are.